Join members of the Northern Kentucky chapter as we show support for the LGBTQ+ community in northern Kentucky! We will be talking about our ongoing voter engagement, issue, and skills building work at the festival, and hope you join us there! Set up a meeting with your representative and senator and join others to lobby for a statewide fairness law. The Fairness Campaign will coordinate visits with legislators in the morning and a rally in the afternoon. KFTC members and fairness supporters will be present to urge the Shelbyville City Council to fill vacancies on the local human rights commission. The vacancies have been in existence since February, and extremely qualified people have applied to be commissioners. Join KFTC members as we celebrate Northern Kentucky Pride and support our allies at Northern Kentucky Fairness! We will be having a table from 2 pm to 10 pm to talk about the work we do to promote justice throughout the state, and help make sure people at the festival are prepared to vote in the 2015 election. In most of Kentucky, LGBT people can still be fired from a job, denied a place to live, and be kicked out of a restaurant – that's true even in many states that now have marriage equality, like Indiana. 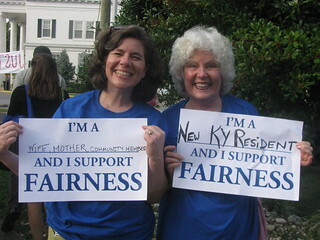 RALLY & LOBBY for a Kentucky Statewide Fairness Law!